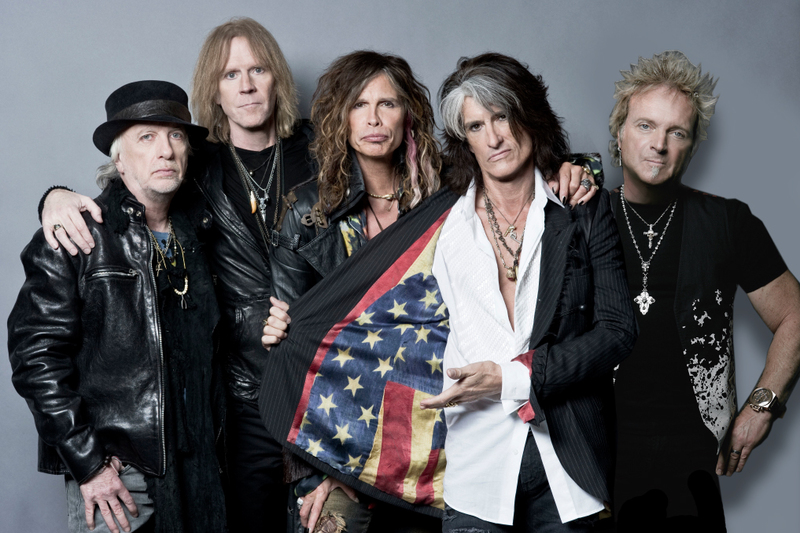 Bloodbrothers – Aerosmith today: Brad Whitford, Tom Hamilton, Steven Tyler, Joe Perry, and Joey Kramer. There is no more quintessential “Boston” rock band than Aerosmith. Since their formation some more than 45 years ago (!) they’ve proudly stood for everything Beantown, and even have an official city historical plaque in front of their old living/rehearsal space. But goddamn – it’s cold up there! 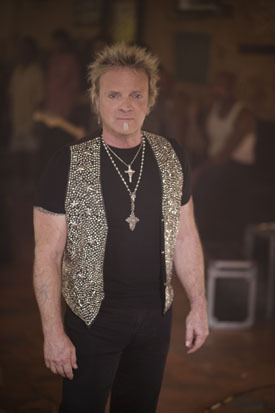 That’s why drummer Joey Kramer is more than happy to enjoy the much warmer climate of his current home in Texas. Houstonian or Dallasite Aerosmith fans shouldn’t take that preference personally. And members of their dedicated “Blue Army” (so named for their preference for denim) enthused about their recent full-length concert film Aerosmith Rocks Donnington. The 19-song set list, filmed at the massive Festival last year, covers the band’s career timeline. But did Kramer, Tyler, and band mates Joe Perry, Tom Hamilton, and Brad Whitford alter their stage norm for historical posterity? “I don’t think about we went about our show any differently, though it would have been easy to let it happen. You’re in front of 100,000 people and have cameras pointed in your face,” Kramer adds. Raunchy boys in the ’70s: Perry, Whitford, Tyler (reclining), Hamilton, and Kramer. 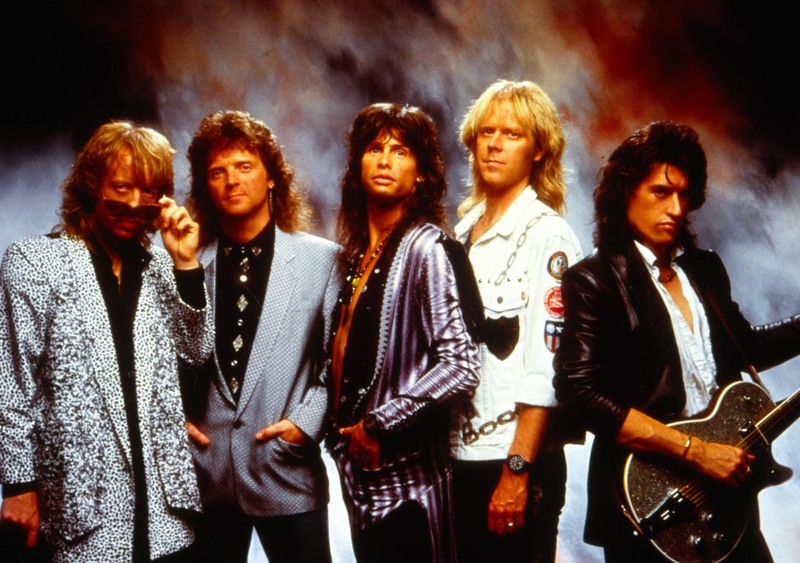 Aerosmith is also one of the few classic rock bands still touring with an intact classic lineup (Whitford was an early, but not original member). And while there have been some periods in their history where that hasn’t been the case, Kramer likens this quintet to…food. 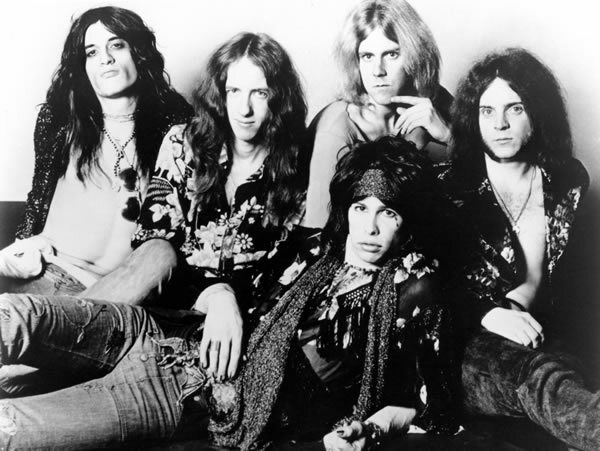 Aerosmith also has something of a literary legacy, having already published an official oral history. And while Steven Tyler’s (Does the Noise in My Head Bother You?) and Joe Perry’s (Rocks) autobiographies got more attention, Kramer’s Hit Hard was the first to come out in 2009. As much (if not more) of a story about his substance abuse and addiction/recovery – as well as detailing a fraught relationship with his father – Kramer says he’s surprised that people still talk to him about it today. Joey Kramer still rocks the soul patch. “It took me four years to write. Most people don’t spend that much time, but I wanted it to be a certain way. The original manuscript was 1,000 pages, and the finished book was 250,” Kramer says. Unfortunately from a marketing perspective, it was also released the day that Michael Jackson died. And what of Perry’s book, that the guitarist said had not sent to his band mates prior to publication? Kramer has also expanded his business resume as the force and co-founder behind Rockin’ and Roastin’ Coffee. A venture he’s quick to point out he doesn’t just lend a famous name to. “I’m very hands on. I’ve cut the coffee, came up with the artwork, and my wife came up with the name,” he offers for the brew that is also the official coffee for the House of Blues Chain. Aerosmith had a big comeback in the ’80s, thanks partially to MTV and some popular videos: Whitford, Kramer, Tyler, Hamilton, and Perry. This entry was posted in Aerosmith and tagged Aerosmith, Brad Whitford, Joe Perry, Joey Kramer, Steven Tyler, Tom Hamilton. Bookmark the permalink.